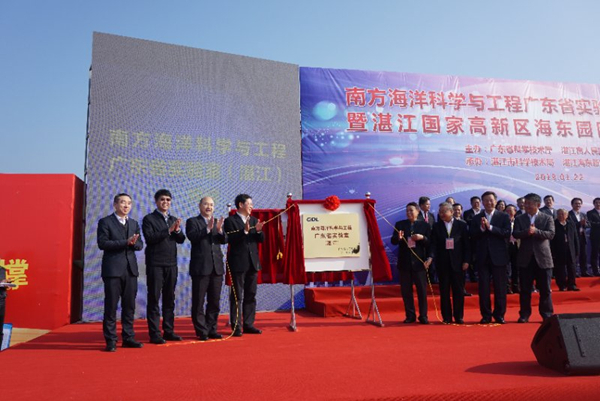 The plaque for the Guangdong Southern Marine Science & Engineering Laboratory (Zhanjiang) was unveiled on Jan 22. The government-run lab will be co-managed by China Shipbuilding Industry Corporation (CSIC), China National Offshore Oil Corporation (CNOOC) and Guangdong Ocean University. It will focus on marine research and technology, and develop marine equipment and resources. The first lab council was established that same day, with a charter, management structure, 2019 working plan and budget already decided upon. Wu Yousheng, a member of the Chinese Academy of Engineering, was selected as chairman of the council. Zhanjiang Mayor Jiang Jianjun, Du Gang, deputy general manager of CSIC, Pan Xinxiang, president of Guangdong Ocean University, and Mi Lijun, deputy general manager of the Zhanjiang branch of CNOOC, were selected as co-chairman. Similar labs have also been built in Guangzhou and Zhuhai.